It's Autumn in Dilworth Park! 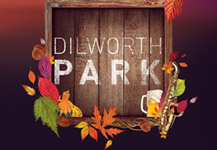 Dilworth Park has the suds, the soundtrack, and the action to keep you warm all autumn long, with a lineup of entertainment and fun, right alongside historic City Hall. PNC presents Live @ Lunch runs through the end of October with performing arts on the city's center stage every Wednesday. Rhythms and CCD Sips at Rosa Blanca Café have one last fling this week and the weekly Farmers' Market will be there all autumn long. Plus, Octoberfest presented by Saul Ewing is just around the corner! Get dates, details and more, at DilworthPark.org/events. With roots in San Francisco, The RRazz Room team fills stages with live cabaret-style acts in four cities. On September 18, Philadelphia’s inaugural season begins at the Prince Theater. RRazz Room-curated acts will play most Fridays and Saturdays, and often Sundays. The Prince’s intimate black box cabaret theater will be regularly filled with show tunes, drag, jazz, comedy and more. Drexel Medicine’s Health Fair will take place in The Shops at Liberty Place rotunda on September 30, 11:30am-2:30pm. Visit the rotunda for free health screenings, including vision, skin cancer, blood pressure and lung function. Health questions will be answered by the Drexel Medicine staff or physicians. Red Bull Art of Can is a nationwide creative competition. Designers, animators, sculptors and artists of all disciplines submit 3D, physical and digital art, using the Red Bull can as inspiration. Come see the winning pieces on display at Dilworth Park, October 1-8. The City of Philadelphia Mural Arts Program is bringing 14 extraordinary artists from around the world to Philadelphia. They will work with Mural Arts to create a new series of public artworks that explore and illuminate Philadelphia’s diverse urban identity. During the entire month of October, The Graham Building at 30 South 15th Street will host the Open Source Hub space, where the public can gather to learn more about happenings during the month as well as experience a portion of the events in the space. Get ready to sweat, Philadelphia! CKO Kickboxing is coming to 1616 Walnut this fall. CKO offers a unique group exercise program for all fitness levels - everyone in class can work at their own pace. Some come for weight loss, toning, others for a fun workout that relieves stress. Elements associated with Kickboxing and Boxing are integrated into a one hour cardio workout incorporating a heavy bag and other calisthenics exercises. There's no contact, no fighting, and it will be the best hour of your day! First 100 members receive discounted membership.